A compact, all-in-one lighting package, the Equinox Microbar Multi System Reloaded includes a robust, heavy duty stand, heavy duty road bag, IR remote, 2 multi-colour LED Par panels and 3 light effects including derby, laser and strobe fitted to a powered T-bar. The 5 LED units are of a micro size and lightweight design. The user has control over colour, auto, sound active and DMX modes, via the LED display and push buttons. The IR remote gives instant and simple control over several control modes: blackout, auto, sound and colour. Considering purchasing the Equinox Microbar Multi System Reloaded? Have questions? Ask people who've recently bought one. 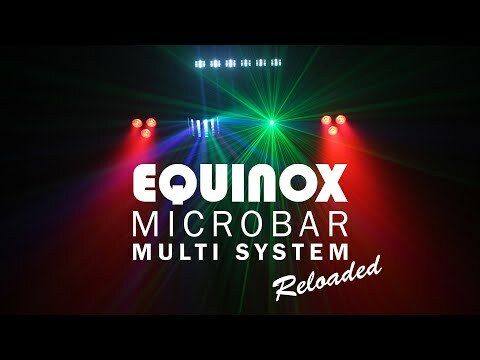 Do you own the Equinox Microbar Multi System Reloaded? Why not write a review based on your experience with it. 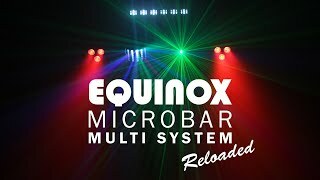 Seen a video for Equinox Microbar Multi System Reloaded online or have you own video? Check out Equinox Microbar Multi System Reloaded on DJkit.com!